What does it mean to be an AGD Master? Dr. Thomas Dolan is honored to be a part of only 5% of dentists to be awarded a Mastership to the Academy of General Dentistry. Mastership status is achieved after completing thousands of continuing education hours, including 400 hours of hands-on courses. Dr. Dolan has been a well-regarded professional in his field for over 30 years. His practice is a unique blend of general dentistry with a special interest in cosmetic dentistry. Dr. Dolan’s passion for dentistry was fostered during his undergraduate training at the University of Pittsburgh, where he majored in biophysics and microbiology, followed by two years at the University of Massachusetts Graduate School, where he studied physiology. Following these rigorous studies, Dr. Dolan graduated from New York University College of Dentistry, and then completed a two-year advanced general practice residency at Thomas Jefferson University Hospital. Dr. Dolan understands the value of continuing his education to stay on the forefront of the latest dental procedures and technological advancements. To this end, he achieved his fellowship and mastership in the Academy of General Dentistry, a degree achieved by only 6 percent of practicing dentists. He upgrades his knowledge of the dental field by continually attending courses and participating in several advanced study clubs including the Spear Study Club, the ITI Implant Study Club and New England Masters Study Club. For over 30 years, Dr. Dolan has had the opportunity to share his knowledge with future dentists as senior clinical instructor at Hartford Hospital’s Dental Residency Program. He is also an adjunct professor at UConn School of Dental Medicine in Farmington. Dr. Dolan’s peers recognize his top-notch skills and have voted him a “Top Dentist” in Hartford Magazine every year since its 2007 inception. Dr. Dolan enjoys volunteering his time and expertise in his local community as well as abroad. For the past 7 years, he and his staff have participated in Mission of Mercy, a free dental clinic offered in varying locations in Connecticut to individuals in need of treatment. In addition, in the spring of 2013, Dr. Dolan and his son, Dr. Brendan Dolan, traveled to Honduras with the UConn School of Dental Medicine to provide free dental care for local residents. 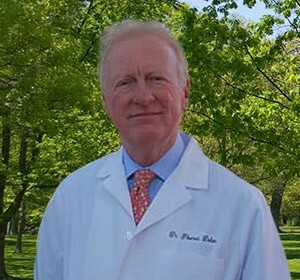 Dr. Dolan grew up in Rye Brook, New York but is proud to call Wethersfield, “home”, having lived there for over 30 years. He is on the Board of Directors for several local non-profit organizations such as Dollars for Scholars and The Keane Foundation. He and his wife, Kathy, have three children: Erin, Sarah, and Brendan. Outside of the office, Dr. Dolan enjoys spending time with his grandchildren and staying active by playing tennis, golfing and biking.